This lovely detached bungalow is hidden in the woods, on a holiday park with all facilities such as a swimming pool, tennis court, boules court and a playground for children. 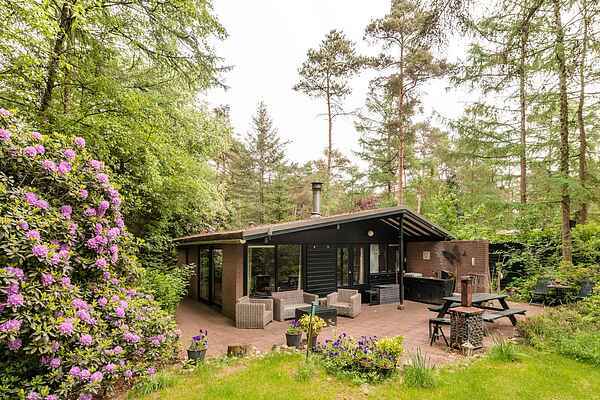 But here all the bungalows lay apart from each other, with their own private garden/ forrest groud, so you can enjoy the peace, nature and forests around you. To the house belongs a covered porch with outdoor fireplace which allows you to enjoy the nature whole year round and makes is possible to live outside at every time of the year. The area is wonderful for walking and cycling. You can maka beautifull trips along the river "Regge" and through the woods of the Salland Landschape. Because of its beautifull nature, Ommen and its surroundings are very popular by tourist for many years. The famous walking route "Pieter Pad" also carries along Ommen.